CAD Forum - How to find net surface area (sans holes) of an unfolded sheetmetal part in Fusion 360? How to find net surface area (sans holes) of an unfolded sheetmetal part in Fusion 360? 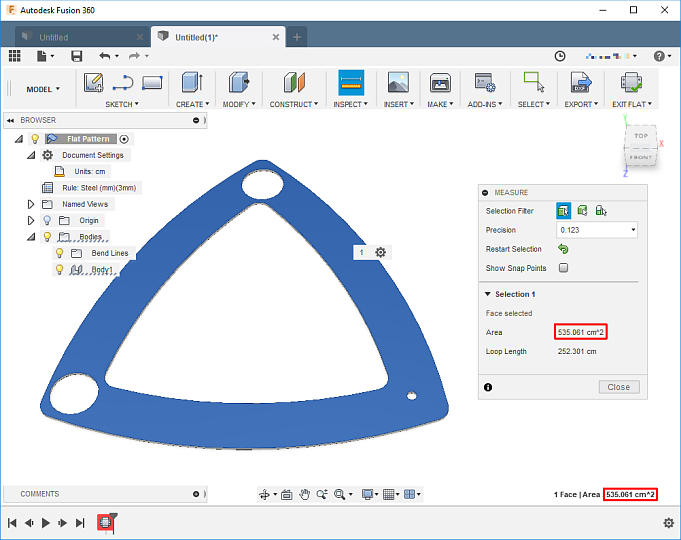 To display a net area of the surface of the unfolded sheetmetal part in Autodesk Fusion 360, just click on the face (one side) of the unfold. Its area is displayed in the bottom right corner. Another option is the function Measure (Inspect > Measure, the key I) - click on the unfold to display its area and loop length. Selected tip: Which CAD formats can be imported into Revit? How to save PDF/A-1a archive from CAD software AutoCAD, Inventor, Revit? « | » How to extract pipe centerlines from 3D point clouds? Please use these tips at your own risk. CAD Studio (Xanadu) is not responsible for possible problems that may occur as a result of using any of these tips.